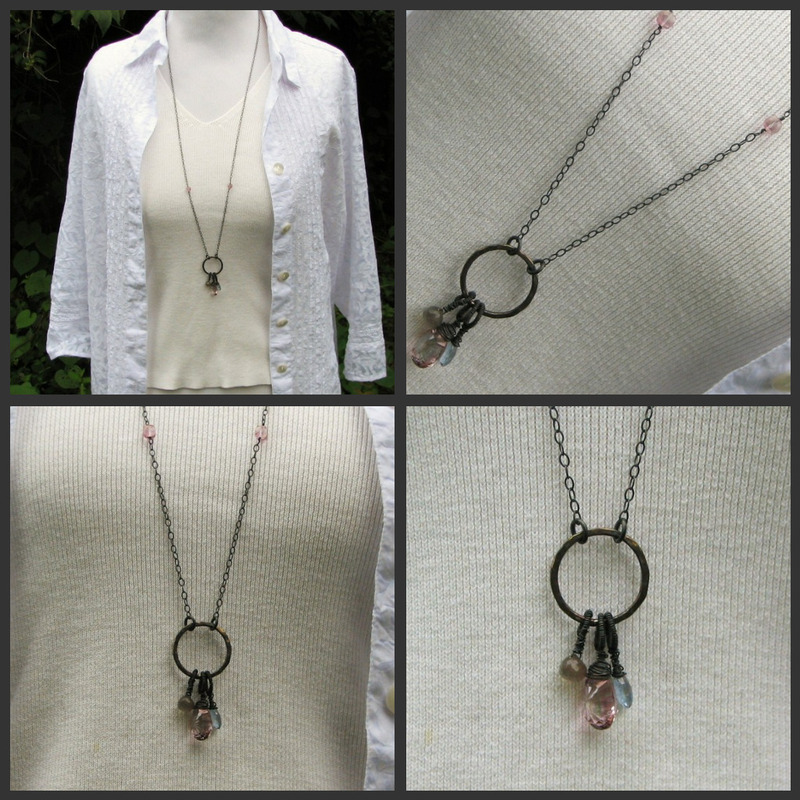 The sterling silver chain is 34 inches long and has 2 pink puffy cubes of pink quartz. The circle pendant is made from fine silver and hammered for texture. I've wire wrapped 3 fantastic briolettes to the circle.The first is a beautiful gold flash onion faceted labradorite, the second is a lovely mystic blue topaz flat pear briolette and last but certainly not least is a humongo large double concave mystic pink quartz! The entire piece was heavily oxidized to make the colors pop! 5. 1 entry for posting a link to this giveaway on your facebook page. 6. 1 entry for posting about this giveaway on your own blog. Please leave a comment here with an email address so you can be contacted and how many entries you had and and what you did to enter. The winner will have 72 hours to respond to the winning announcement and give me their shipping address. If not, there will be another winner chosen . The giveaway will run today August 14th until August 28th midnight EST. A winner will be chosen using random.org on August the 29th! Pretty necklace! I like your work. Very Pretty! Love the design! you have lovely wire work...the artisanship of your work is just spectacular! I'm so glad you relaunched! I'm in love with blogs. I didn't even know you had one. ^__^ I'm following you now, and re-tweeted your giveaway post on my Twitter. The necklace is gorgeous! Someone's going to be very lucky indeed to walk away with it. :D Congrats again on your relaunch! I'll be looking forward to your posts! beautiful work. i love this necklace. Gorgeous. I should have 3 entries. One for the comment, an entry for following you on FB and your blog. Really nice work. Your jewelry is truly gorgeous. I love this necklace with its long chain and beautiful hammered silver. I have fanned you on facebook. I wish I had your talent. You and I seem to share a love for labradorite. I am a brand new blog follower, and I can't wait to see more! Lissa I love this piece!!! You are an inspiration to me! I would love to enter....I think I'm up to 4 entries! I hit Like on Facebook. :) My username there is wunderfraulein. I would love to win this necklace. I would love to be entered. thank you so much. This is such a beautiful necklace! I love it. Great necklace! I love the way it hangs and the length. I wanna win! What a perfect necklace to go with jeans & a t-shirt! Gorgeous! Sweet! Ok, I got the word verification thingy to work finally. weird. Anyway, please enter me for your necklace! I've got 5 entries, (I don't tweet) and my name isn't really Sadie, it's Stardancer! I should have 2 entries: one for this comment and one for following your blog. I'd love to enter if this is open worldwide. That necklace is just gorgeous!! You do beautiful work. I would be thrilled to win this piece. Thanks for the chance. I l♥ve the necklace and the new look of your blog! Am a fan on FB! I posted about this on FB! Christina - xristya@rock.com - Very elegant jewelry! Anyone would love to win this prize! Lovely necklace. Thanks for offering it. beautiful--lovely craftsmanship and great aesthetis sense! please count me in to win! I hope I win, thanks. Very pretty necklace, and I love the length of it. I'd love to win this pretty necklace. I love the necklace, classie look to it. FB friend here ;-) I also posted it on my FB fan page and tweeted it! Oh so want to win the delicious necklace! Wow, loving your work so far. The necklace is really pretty! WOW! You do BEAUTIFUL work! I would love to feature you on my blog too, with some of the photos of you work. I think that my readers would love your stuff! Very unique. I love it!! I followed you through networked blogs, commented on your stuff, and tweeted about you. posted your link on my facebook page as well. I can't remember if I was following your blog before or after this,I think it was after.I had already fanned you before,so you don't have to include that.I posted on my fb fan page,which links to my twitter. So that would be 4(?) so far,I think.